I am a huge sucker for anything in cute packaging - doesn't matter what it is: gum, creamer, tissues - I'll buy it if I like how it is packaged together. This is why I am so excited to show you this little milk carton box! This little bundle of goodness is filled to the top with chocolate and it will be a wonderful little gift for Valentine's Day - my daughter is already eyeballing it! It would be really fun to make one for each of the kids - or maybe just for me, hehe! Actually, I plan to make one for each of the women in my group at MOPS - wouldn't a table full of these be the cutest ever?!! Before folding the box, I randomly stamped the hearts from Love Everywhere in Riding Hood Red ink. 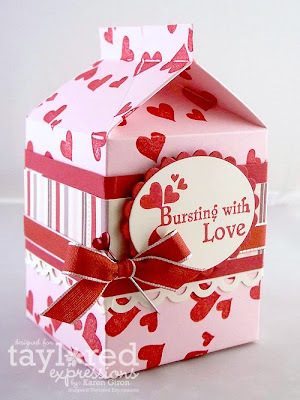 I loved the Bursting with Love sentiment and thought it was perfect to use with this box full of delicious treats. After assembling the box, I added the paper band, complete with the yummy apron lace trim, and then tied a little bow with the heart pin in it. Is anyone planning on heading to Anaheim tomorrow or Saturday for CHA? I'd like to invite you to stop by the Taylored Expressions booth for a day filled with make & takes, shopping, demonstrations, and not to mention meeting many of the Baker's Dozen! This is tooo too cute Karen!!! I think it's absolutely perfect! What a great gift to give the MOPS ladies!